The compact PID temperature controllers of the CS6x series offer display, control and monitoring of temperatures. The PID temperature controllers feature a multi-function input for resistance thermometers, thermocouples and standard signals, meaning the configuration of the sensor input can be set. Thus the flexibility of the controller is considerably increased, and warehousing is made easier. An alarm output for monitoring the actual value is also available as standard. 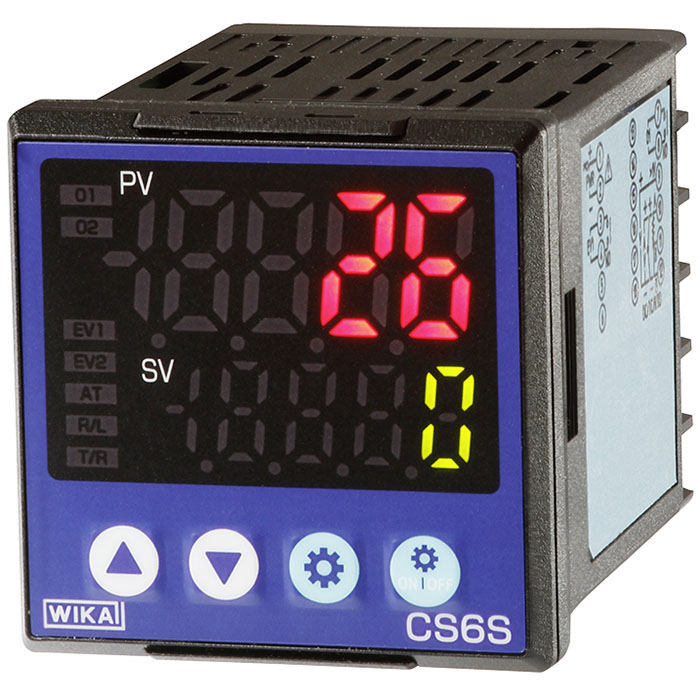 The control parameters of the PID temperature controllers can be set across broad ranges. Auto-tuning, which facilitates finding the optimal control parameters, can be activated. The monitoring output of the PID controller can be set either as relay (for slow control), as logic level for the control of electronic solid state relays (for fast control and high current loads) or as a continuous 4 ... 20 mA output. Hysteresis is available with on/off control mode. As options, for the model CS6x PID temperature controllers there is a 2nd alarm output available for the monitoring of the actual value and the control loop, and a heater burnout alarm for monitoring the monitoring output, or, alternatively, a 2nd monitoring output. An RS-485 serial interface is also possible. In addition, for this model series various accessories, such as terminal covers or current transformers, are available. The ingress protection of the PID controller is IP66 at the front and IP00 at the back (in accordance with IEC 60529/EN 60529). The actual value of the measurement is indicated in red, the set point in green, each in 5 digits with a 7-segment LED display.